Poverty in the inner-city is more powerful than cocaine. Other researchers also couldn’t find any devastating effects from cocaine exposure in the womb. Claire Coles, a psychiatry professor at Emory University, has been tracking a group of low-income Atlanta children. Her work has found that cocaine exposure does not seem to affect children’s overall cognition and school performance, but some evidence suggests that these children are less able to regulate their reactions to stressful stimuli, which could affect learning and emotional health. Read about the study and the conclusions here. At a time when 2 in 10 children are living in poverty in the United States and many of those are living in the inner city, we need to be paying very close attention to what studies like these tell us. 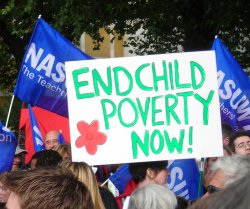 This along with the studies that conclude that nutrition is a huge factor on school performance and brain development (also something common sense could tell us), it just doesn’t make sense that “we” are not desperately trying to end child poverty. It’s definitely not a time to be cutting programs that help feed and educate these children plus provide intervention services to help them and their families out of it.